Seals, caviar and oil: the Caspian Sea threatened by pollution. Caspian: Small seals on the shores of Baku Bay: this show is no more than a childhood memory for the natives of the capital of Azerbaijan, as a result of pollution and climate change affecting the Caspian Sea. Hunted intensely until recently, this mammal now suffers mainly from industrial pollution, which makes it particularly sterile. Small seals on the shores of Baku Bay: this show is no more than a childhood memory for the natives of the capital of Azerbaijan, as a result of pollution and climate change affecting the Caspian Sea. This closed sea counted at the beginning of the 20th century a million Caspian seals (Pusa caspica). Today, less than 10% remain and this species is considered "endangered" by the International Union for the Conservation of Nature (IUCN). Azer Garayev, president of the ASPA animal welfare association, still remembers hundreds of dead bodies discovered during a mission more than 15 years ago. Since then, "nobody has dealt with this problem," sighs the 57-year-old activist. For him, "the seal is an indicator of all major environmental problems" of the Caspian Sea, the largest closed sea in the world. Bordering Iran, Azerbaijan, Russia, Kazakhstan and Turkmenistan, it also shelters huge hydrocarbon reserves, exploited intensely since the 19th century. Caspian waters are estimated to contain nearly 50 billion barrels of oil and 300 billion cubic meters of natural gas. Also a unique flora and fauna in the world that suffer from hydrocarbon-related activities as well as the sea level decline caused by global warming. According to the United Nations Environment Program, the Caspian Sea "suffers from a huge pollution load from the extraction and refining of oil, offshore oil fields, radioactive waste from nuclear power plants, and huge volumes of untreated wastewater and industrial waste introduced mainly by the Volga River". 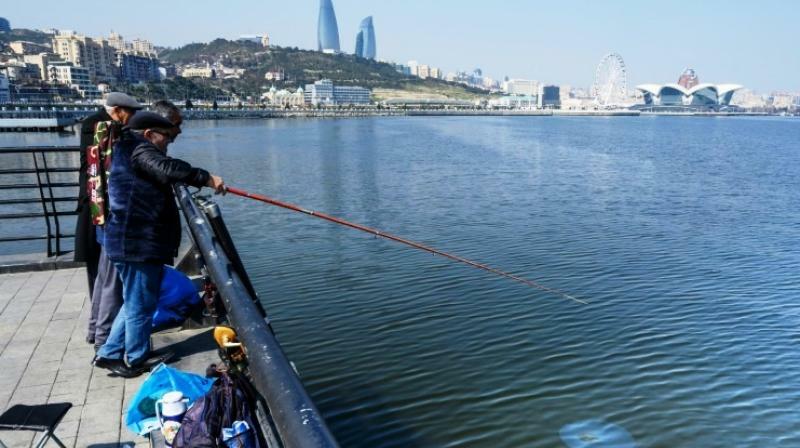 A few kilometres from downtown Baku, fishermen are waiting for fish at the edge of the coastal road. In the water, small drops of oil regularly appear, spreading in streaks with multicoloured reflections. "Some fish seem to prefer polluted water, so they tend to congregate here," said Rachad, 26, a small cap screwed on his head, acknowledging: "The water is dirty". A plastic bag caught in his hook.